Joan Figueras Bello is a Barcelona-based photographer who runs the production company Filma-t Produccions with his girlfriend Anna Moradell. Together they do photography and videography production. Born 35 years ago in Tarragona, Catalonia (Spain), Joan considers himself as an observer since his was a child. After he studied English and Journalism and traveled around the world, he finally started with his true passion. I recently got in touch with Joan, because I wanted to have his portfolio on Tilpy. Now he’s part of our great network of handpicked Pro Photographers. And of course I didn’t want to miss out the opportunity to ask him some questions about his passion. How do you get the person, place or thing that is in front of the camera onto the film, chip or paper in just the way you want? To me the most important is emotion. In order to decide to do a project or some pictures, the personal relation with that matter or person has to be important. From my point of view there is no other way to do photographs than committing oneself with the subject as much as possible. Without emotion, reaction, joy, sadness, failure there is no photo for me. I do not know if am influenced by any particular photographer, but I really like some Catalan photographers that worked during the dictatorship in Spain in the 50’s and 60's, some street photographers like Joan Colom, Xavier Miserachs or Francesc Català Roca because they change the way we looked at things. These photographers were half way of the street photography, photojournalism and documentary photography. They were just amazing observers that showed Barcelona and their people in a very different way than we were used to. They somehow show us the way, the light, the people, the life of Barcelona of those dark ages. Although they were dark we can see some fun, smiles and happiness. That contrast made them special and unique storytellers. What do you want to say with your photographs, and how do you actually make your photographs to say that? In principle what I want to explain is a feeling, a moment. The world moves thanks to intelligence but mainly through emotion. Normally I portray people in a determinate moment. 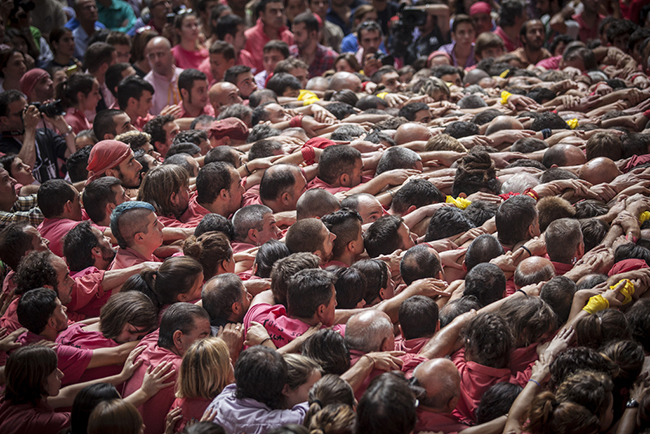 If we talk about human towers or castells, we are talking about culture, about Catalan culture. But above all what I see is humanity. No matter where we come from, we need the same values to construct anything. In this case values like strength, balance, common sense, effort, organization, persistence. 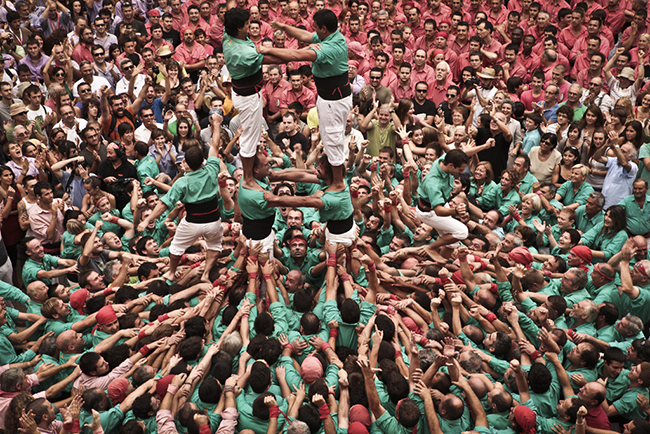 That is why I love everything about castells, because no matter where you come from you can understand and value what they are doing, and how difficult it is to reach to the top. I see everything represented in human towers: beauty, structure, colors, portraits, emotion, win, lose, success, failure…that’s life!!! Indeed it is very modernist, very Gaudinian, to mix functionality and decoration, modernity and tradition, a strong dialogue between architecture and nature!!! And obviously whenever you see the reaction of the people no matter what happens – good or bad -, you just fall in love with this cultural manifestation. What was your career path? How did you get from being an aspiring photographer to actually doing it full time, for a living? I would say that everything I did in life led me to the photographer I am right now. First of all I consider myself as an observer, when I was a little kid I was already looking to life surrounding me with open eyes. I loved to be sat on benches like an old man observing people passing by. Then I studied and travelled a lot, which also gave me another way to look at life. Then I started studying photography and pretty much learning by doing. Besides one of the activities that I do for my business are photo-shoot tours, where we explain some things about Barcelona and we also portray people in the old and narrow streets. This also helps me to deal with people, to know the light, the corners, the angles…I learn everyday that I shoot. What technology/software/camera gear do you use to keep focused on what you do best, as you photograph? I mainly use Canon 5D Mark II with lenses like 50mm f.1.4, 24-70mm f.2.8. Depending on what you focus on, the equipment and your attitude in front of the people help a lot to obtain good results. For street photography I prefer to use the 50mm, or even another camera lighter and more silent, like Panasonic Lumix DMC-LX 100 f.1.7 - the more invisible and common person you are, the better to not being discovered. Indeed we are hunters. When I work in culture in general I prefer to use a better camera like the Canon 5D Mark II because in general nobody is bothered by being photographed. How do you get paid to do what you want to do with your photography? I have my own production company. My girlfriend and me are photographers and videographers. We do from wedding photography to corporate to commercials, documentaries and so on. The hard thing is to get known and paid as a photojournalist or street photographer, to get a name. But step by step, little by little we are making our dreams come true. As I mentioned throughout the interview if I do not feel the things, then I am not doing it. Actually it makes me feel happier something I really believe in, without even being paid, than getting paid for something that I do not believe. I am not saying that I do not want to be paid for my job. For me emotion is everything. Maybe the ranking would be emotion, money, intellect, and politics. It is like Cartier Bresson said: “to photograph is to put on the same line of sight the head, the eye and the heart”. 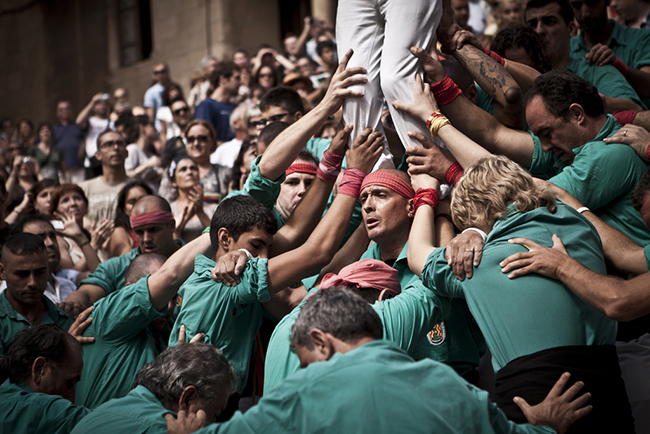 I’ve never heard about the Catalan tradition ‘El batec casteller’. Can you tell us what it is all about? 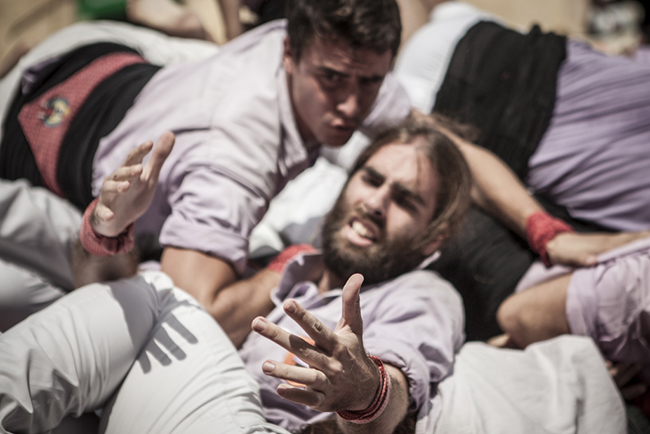 First of all ‘El batec casteller’ is not a tradition, it's just the name that I gave to my project of castells. Basically it is an original way to show culture, because it mixes photography and sound. I think that when you add sound to photography, it adds to it a very powerful effect that increases the strength of pictures. I did not want to show castells through a video, because it is very often seen and it is not adding anything new to the image. Whereas adding sound to the images is just a different and original way to show culture, to impregnate the picture with another sense. Sometimes it is just not enough expressing this cultural manifestation only by an image. You actually have to feel it, to experience it, to become part of it and by this format I believe that one can feel like as if being there. 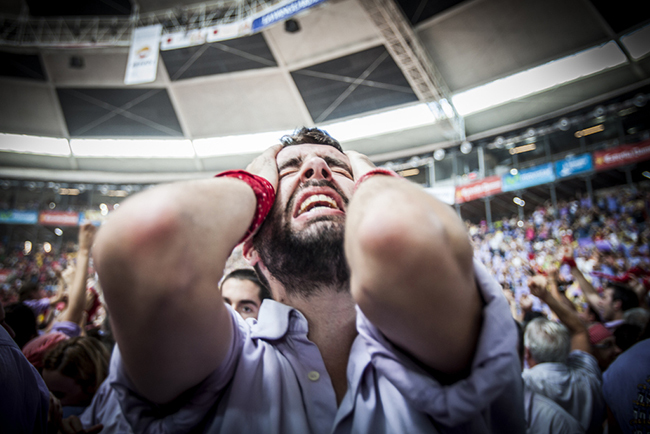 ‘El batec casteller’ means ‘human tower heartbeat’, but in English I’d rather call the project ‘the Catalan heartbeat’, because of the way I present the pictures. Almost every shot of the camera is like a heartbeat and the political moment that we feel right now in Catalonia is very important, and of course human towers represent very good both our culture, our people and our will to become a free country. Time will say, but no one could ever tell us that we weren’t trying hard. 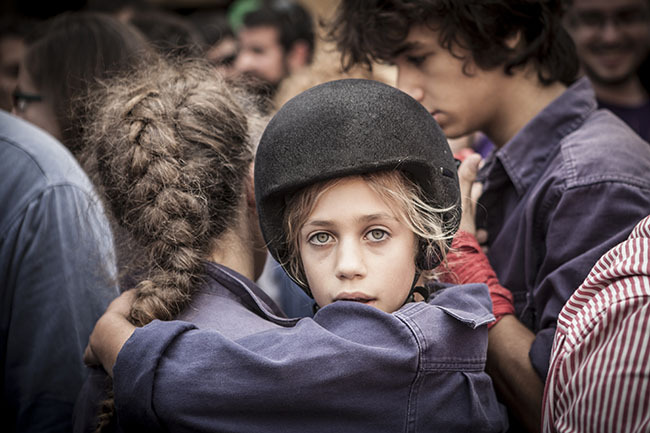 The Catalan Heartbeat from Filma-t produccions on Vimeo.